Today, ExcelinEd released a new brief Perkins V Reauthorization: Opportunities, Challenges and Risks for States. ExcelinEd’s Director of Innovation Policy, Melissa Canney, introduces us to the eight shifts Perkins V makes that present critical decision points for states pursuing high-quality CTE programs. This summer, we witnessed a refreshing show of bipartisan action resulting in the “Strengthening Career and Technical Education (CTE) for the 21st Century Act” (Perkins V). Perkins V reauthorizes the Carl D. Perkins Career and Technical Education Act of 2006 (Perkins IV). The legislation’s overwhelming bipartisan support stemmed, in large part, from the urgent need for alignment between our K-12 systems, postsecondary institutions and the workforce. The students who were in kindergarten the last time Perkins was updated are now seniors in high school. As these students have grown and matured, so have the labor market demands and expectations for postsecondary credentialing. There is increased local and national attention on the skills gap and the number of unfilled jobs requiring specific knowledge, skills and credentials. Our educational system’s ability to prepare students for success in life plays a critical role in the growth of state and local economies. 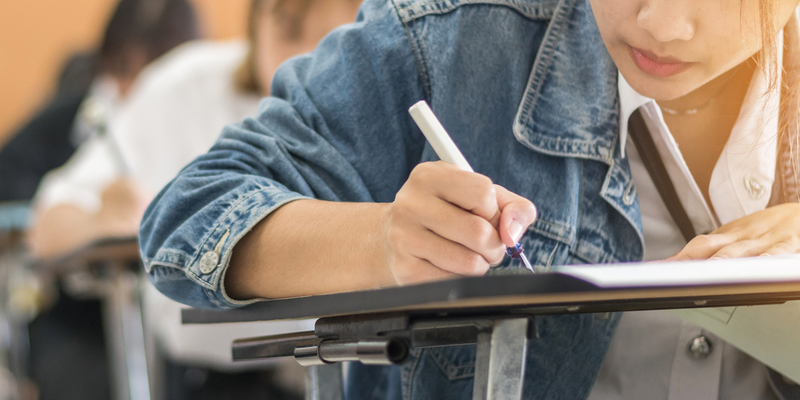 Changes to Perkins V follow recent trends in related federal legislation—the Every Student Succeeds Act (ESSA) and the Workforce Innovation and Opportunity Act(WIOA)—by providing more flexibility to states in developing and implementing their CTE programs. In addition, Perkins V places greater emphasis developing clear connections between programs and labor market demands and expands accountability subgroups to include services to historically underrepresented populations. 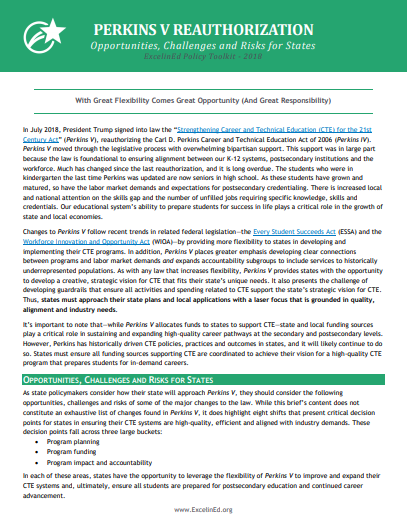 As with any law that increases flexibility, Perkins V provides states with the opportunity to develop a creative, strategic vision for CTE that fits their state’s unique needs. It also presents the challenge of developing guardrails that ensure all activities and spending related to CTE support the state’s strategic vision for CTE. Thus, states must approach their state plans and local applications with a laser focus that is grounded in quality, alignment and industry demand. It’s important to note that—while Perkins V allocates funds to states to support CTE—state and local funding sources play a critical role in sustaining and expanding high-quality career pathways at the secondary and postsecondary levels. However, Perkins has historically driven CTE policies, practices and outcomes in states, and it will likely continue to do so. States must ensure all funding sources supporting CTE are coordinated to achieve their vision for a high-quality CTE program that prepares students for in-demand careers. ExcelinEd’s new brief Perkins V Reauthorization: Opportunities, Challenges and Risks for States identifies ways states can approach Perkins V and some of the major changes to the law. While this brief’s content does not constitute an exhaustive list of changes found in Perkins V, it highlights eight shifts or critical decision points for states in ensuring their CTE systems are high-quality, efficient and aligned with industry demands. These decision points fall into three categories. States are encouraged to invest in early postsecondary opportunities. The state planning process requires more stakeholder collaboration and review. Local recipients must complete (and update) new Local Comprehensive Needs Assessments. States and local recipients have more flexibility in how they spend Perkins funds. There is a new definition of CTE concentrator. States must choose among three new measures of secondary CTE program quality. States determine their own accountability goals and performance targets. In each of these areas, states have the opportunity to leverage the flexibility of Perkins V to improve and expand their CTE systems and, ultimately, ensure all students are prepared for postsecondary education and continued career advancement. Stay tuned for a deeper look into these eight areas—including the opportunities, challenges and risks they present for states.